You’re taken to a page that lets you manage your S3 resources. (See this figure.) If you have sharp eyes, you’ll quickly notice that there’s nothing listed on the page. So the first thing you have to do is create a storage resource where you can place your first object. 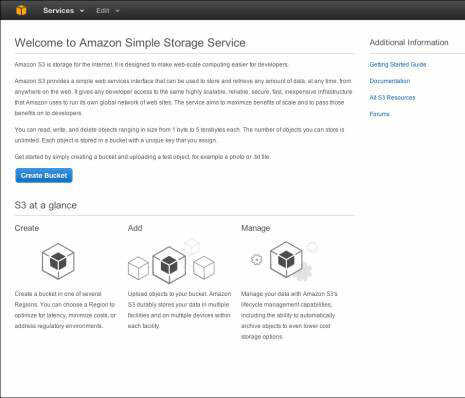 Before you walk through the step-by-step process of creating a storage resource, though, read up about terminology. You’ll notice on the left side of the S3 screen is a button labeled Create Buckets. 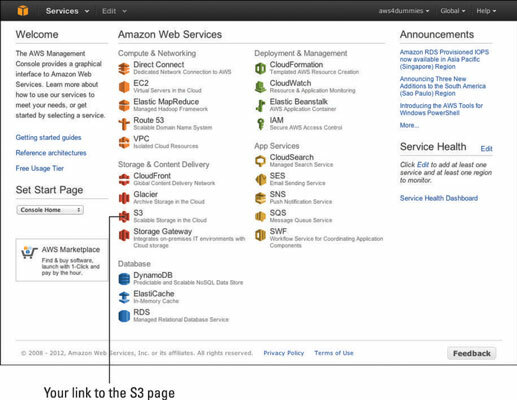 Now, you may wonder why something that sounds like you’d buy it at a hardware store is prominently displayed in AWS. Bucket names must be unique within the entire AWS system. The names must be unique across all user accounts. So if you have a pet named Star and decide to name one of your buckets Star in his honor, and somebody else has already named one of her buckets Star, well, you’re out of luck. This isn’t terribly convenient, but that’s the way it is. Although bucket names are global (unique across the entire AWS system, in other words), buckets themselves are located in a particular region. Let’s say you want a bucket to reflect your company’s name — Corpname, for example. If you use Corpname to create a bucket, you’ll isolate that name to a single region, even if you want to place objects throughout the world in a bucket associated with your company’s name. So, a better strategy is to use a common identifier with region-specific information as part of the bucket name; for example, you can use Corpname-US-East for a bucket in the eastern US region and Corpname-US-West-Oregon for a bucket in the region associated with Oregon. Use all lowercase letters in creating a bucket. Even though the official S3 naming rules let you use uppercase letters, the S3 Management Console doesn’t allow them for buckets created in most AWS regions. If you try to include uppercase letters in the bucket name, the Console returns an error message. Keep in mind that, although AWS is a wonderful service, it does have its quirks. You can always find a way around them, but don’t be surprised when you run into things that don’t work just the way AWS says they will. On the S3 home page, click the Create Bucket button. Doing so brings up a screen similar to the one you see in this figure. Enter a name for your bucket in the Bucket Name field. Because this is just an experiment, feel free to choose any name you like — and don’t worry — if it’s a bucket name that’s already in use, AWS lets you know. Choose a region from the Region pull-down menu. 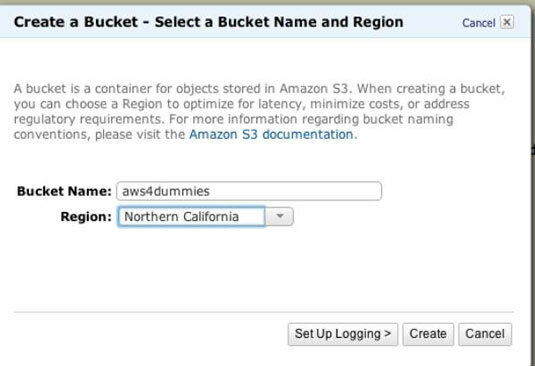 AWS creates your new bucket and returns you to the S3 page for managing your resources. There, you see something like this figure, which now lists the bucket you just created. Congratulations! You’ve now done your first bit of cloud computing. Of course, it’s not useful yet — your bucket just sits there, like an empty filing cabinet, so put something into it so that you can see how it all hangs together.